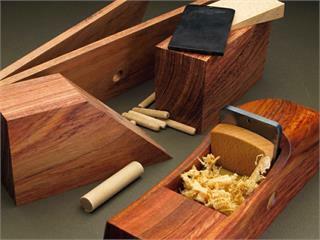 Our precision made kit provides a quick, sure way to realize the satisfaction of using a handmade wooden plane. Complete with a HOCK PLANE-IRON ASSEMBLY all you need is a drill, some clamps, glue, a knife to adjust the throat, sandpaper (or plane) to true the sole, and a means of sharpening the iron. These kits are precision-made from bubinga or jatoba (bubinga is now listed as a threatened species by CITES so we're switching to jatoba as the supply dwindles*). The O1 Hock blade is bedded at 95° and hardened to Rc58 for burr "rollability". The parts are taller than our Krenov-style Plane Kit (below) to allow for necessary blade access and a comfortable grip. A HOCK kit is ideal for the novice as well as the professional woodworker who can't find the time to make a plane (or another one or two...) Our design is a basic Krenov-style, flat-bottom wooden plane -- simple and elegant. We accurately mill bubinga or jatoba.